Mid-to late 14th century Gascon. As the younger son of lesser nobility, I would never inherit, so I sought to gain fortune and renown serving as a man-at-arms for the French crown. It was either that or take up the life of a monk, which simply did not suit my marshal nature. Group or Household affiliations if any? 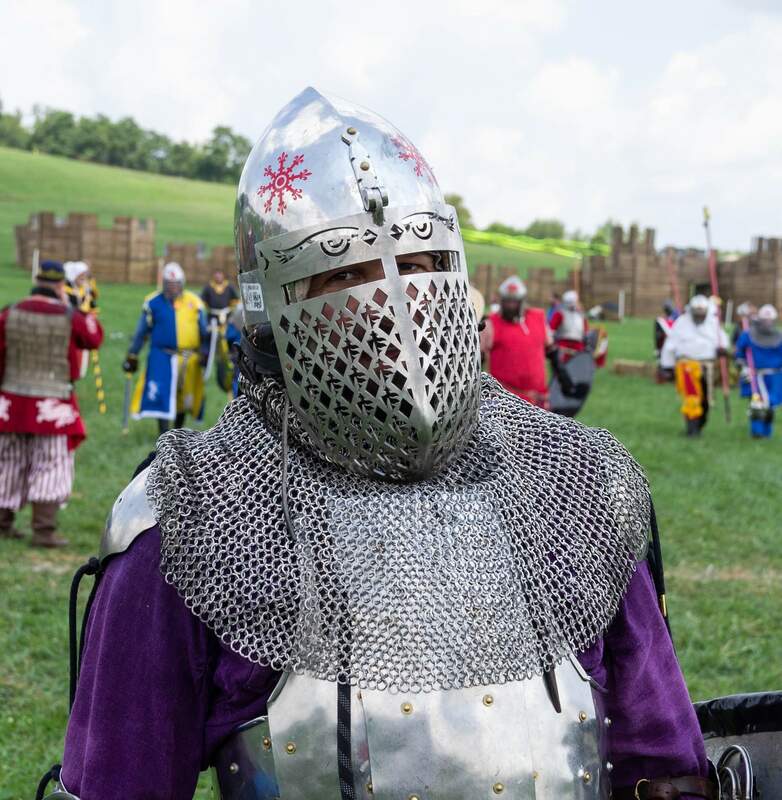 As a squire to Count Alric, I am a member of Wyvern Guard, which is part of Talbots Keep. In my earlier days I was also affiliated with House Cuthbert and House Crippled Quill. Tell us a bit about your life outside the SCA. I grew up a nerdy kid in Northwest Ohio, mostly in Toledo. I loved, and still do love, books on history, sci-fi and fantasy, comic books, movies and anime, role playing and war games. I worked in grocery retail for close to 20 years before a friend showed me an opportunity to change careers. Now I sell steel for a living. Moving to the greater Pittsburgh area has been a very good experience. I have been enjoying all the restaurants and music venues. Oh, and mentioning music, somewhere in the misty past I went through an “angry young man” phase where I hung out with some folks from the punk scene. It rather influenced my taste in music and politics. I also helped raise 7 kids that miraculously survived to adulthood and thus far have avoided lifelong incarceration. Though I am proud of them, most of the credit for that goes to their mom. What SCA activities do you participate in? I like to fight. Heavy and fencing are both fun, but I have a lot more time, effort and money invested in heavy. Throwing and archery are great too, though I rarely participate. The Iron Comet competition is a great opportunity to do all these activities. I have dabbled in a lot of arts and sciences. I can sew my own garb, do some leather work, some armoring. I have done some calligraphy and illumination. I have brewed a few batches of beer. Recently, I found coining. I may have finally found an art that has captured my attention enough to do more than dabble. I have been practicing engraving, so I can get better at it. Tell us a little bit about your SCA experience (offices, etc.). I found the SCA thanks to a high school friend I hadn’t seen in a couple years giving me a call and saying, “Dude! I found this THING. You are gonna love it! 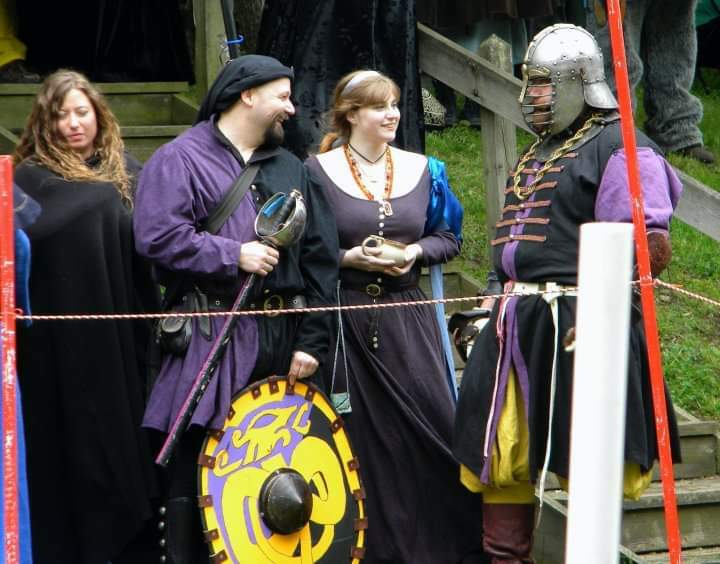 There’s an event they call the Pennsic War!” He then brought me to a meeting of the Canton of the March of the Marshes in Bowling Green, Ohio, in Middle Kingdom’s Barony of Red Spears. 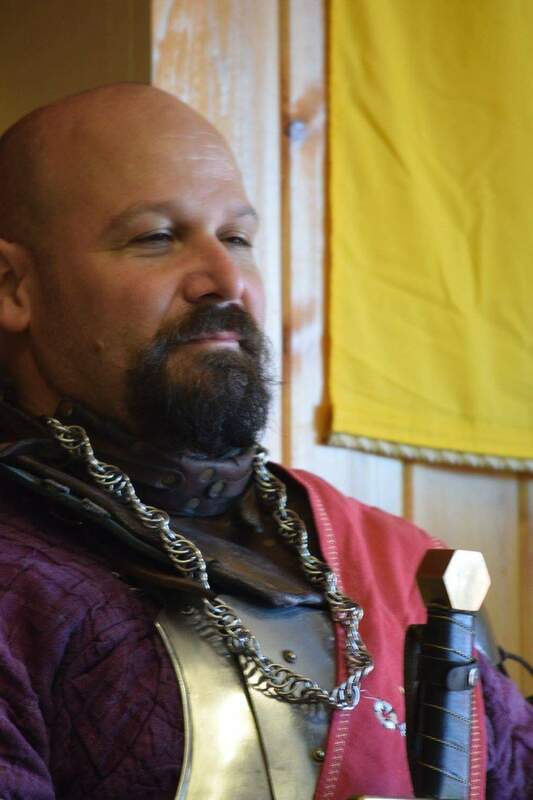 (On a side note, before my time March of the Marshes was founded by this legendary figure, who taught all the BGSU heathens to love the SCA, the arts, dance, service, and then beat them into the ground with his mace, Count Sir Jehan. I was thrilled to meet this renowned knight when I moved to Æthelmearc.) My first event was Feast of the Red Dragon where I got to see a tournament. That’s what really hooked me. I accidentally joined a household early on without understanding the implications and expectations. It made for some bad times but eventually got over it. I played in the Middle off and on until I moved to Æthelmearc in 2004. Since changing careers in 2008 and therefore no longer working every weekend, I have been able to be much more active. I have marshaled a lot and even run an event. I held offices in St. Swithin’s Bog, knight marshal and deputy seneschal. I currently am an at large marshal for heavy. Twice I was honored to serve on the Queen’s guard. I was the captain of the Baronial Guard in St. Swithin’s Bog. After numerous times being second, I was Baronial champion for heavy. Many years ago I had been champion in Red Spears, but I wasn’t happy with how I performed my duties. So I was glad that I got another opportunity. What are your goals in the SCA? I wish to be knightly and hopefully inspire others to be as well. If you could accomplish only one thing in the SCA in the year 2018 what would it be? I hope to make a set of coin dies on my own and successfully strike coins from them. First and foremost, it is okay to ask questions of just about anyone. If you are shy, just remember a lot of us are too. It may not look like it. I have been told I come off like some sort of social butterfly. But you are seeing us interact with people we have known for years, maybe even decades. Get to know lots of people. Try anything and everything that catches you eye. That’s the only way to find what will give you joy. Don’t join a household right away. You may find a better fit after you get more comfortable. If you fight, you will most likely at some point get hurt. If and when it happens give yourself time to heal. Seek medical attention if necessary. In other words, don’t be like me in this. If you magically woke up with an SCA talent you do not already have what would it be? I would wish for my skill at engraving to catch up with my ambition, so I can accomplish my previously stated goal.